A light well, a glass staircase and large windows set behind wooden louvres help to bring natural light into this four-bedroom house, which Belsize Architects squeezed onto a small plot in a traditional mews near London’s Hyde Park. 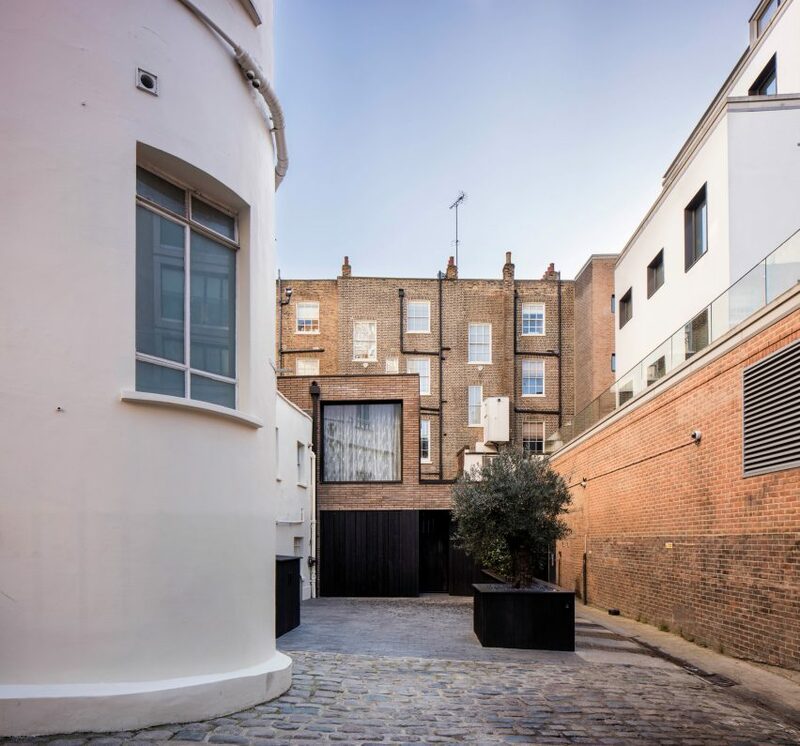 Local studio Belsize Architects designed the house to replace a one-bedroom mews cottage in Southwick Yard – a cobbled courtyard surrounded by taller buildings. 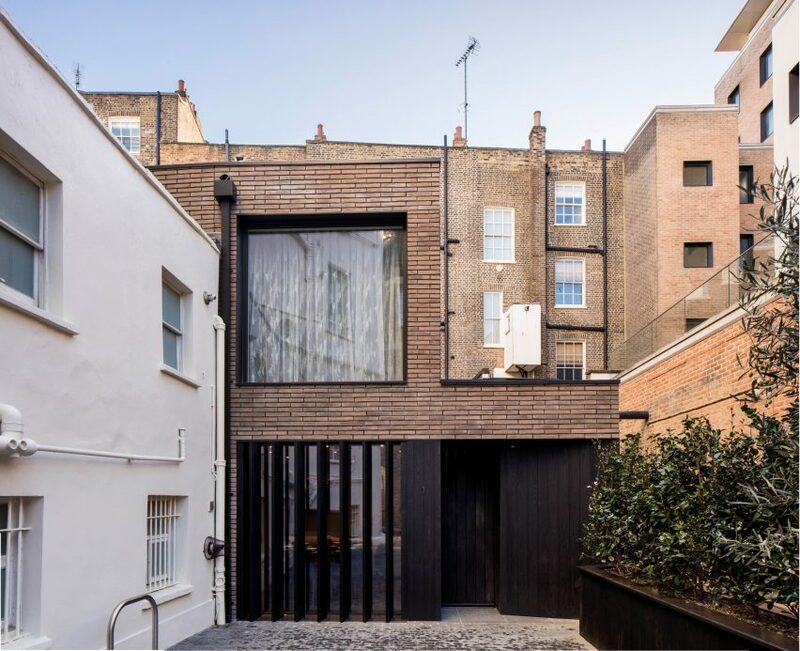 The existing building’s poor layout and drab interior led the studio to propose demolishing it to make way for a more spatially efficient and generous house incorporating a basement level. The property’s exterior features a pared-back material palette of slim bricks, glass and dark wood that complements its traditional setting. 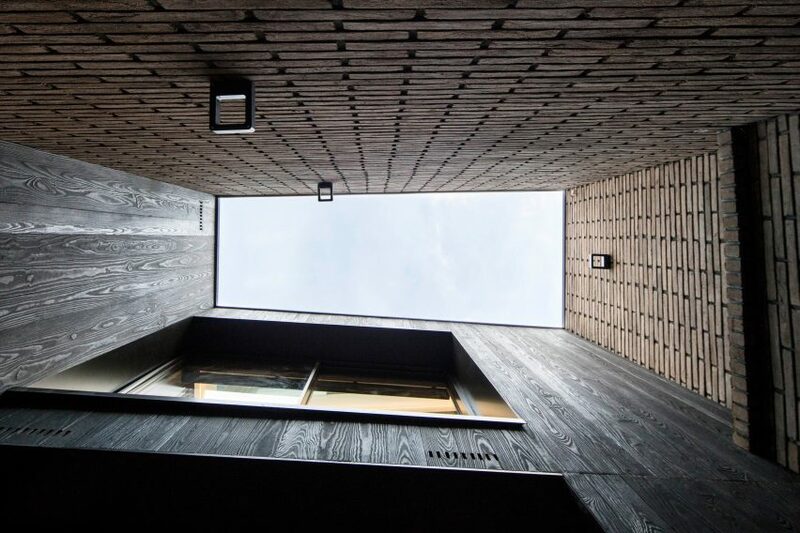 The main elevation incorporates a large first-floor window positioned above a surface of timber louvres that have been charred using the traditional Japanese technique of shou-sugi-ban to give them a resistant and long-lasting finish. The louvres are set in front of full-height windows and provide complete privacy when closed. A remote-controlled mechanism allows the panels to swivel open to flood the interior with daylight. “The design team worked extremely hard to maximise both space and light – a considerable challenge given that the site sits tightly beneath tall five and six storey buildings,” said Belsize Architects in a statement. The studio adopted several innovative techniques to ensure natural illumination reaches every level of the house, including a basement accommodating two double bedrooms alongside an en-suite bathroom, shower room, media room and utility room. 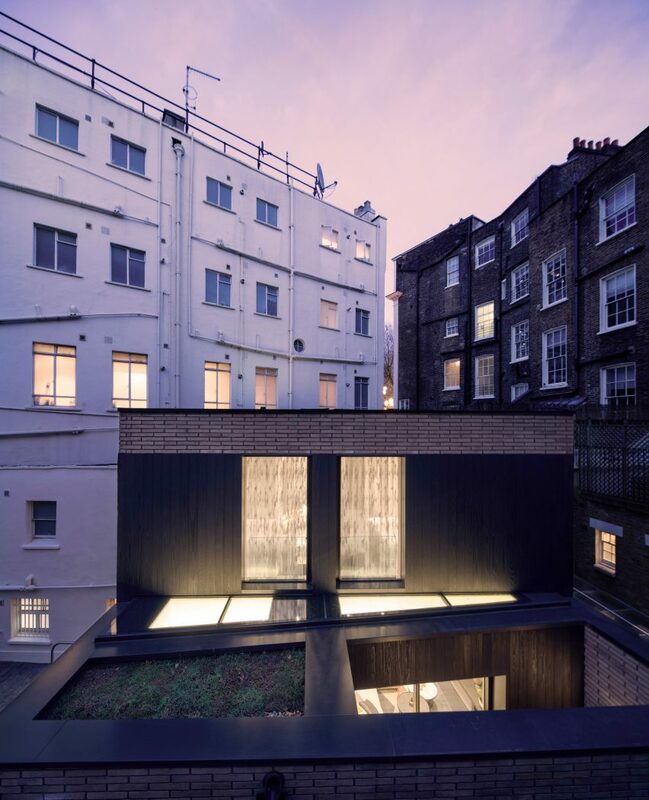 “A light well reaches down through the building to form a small external courtyard at basement level, bringing natural light and ventilation into the two basement bedrooms,” said the practice. 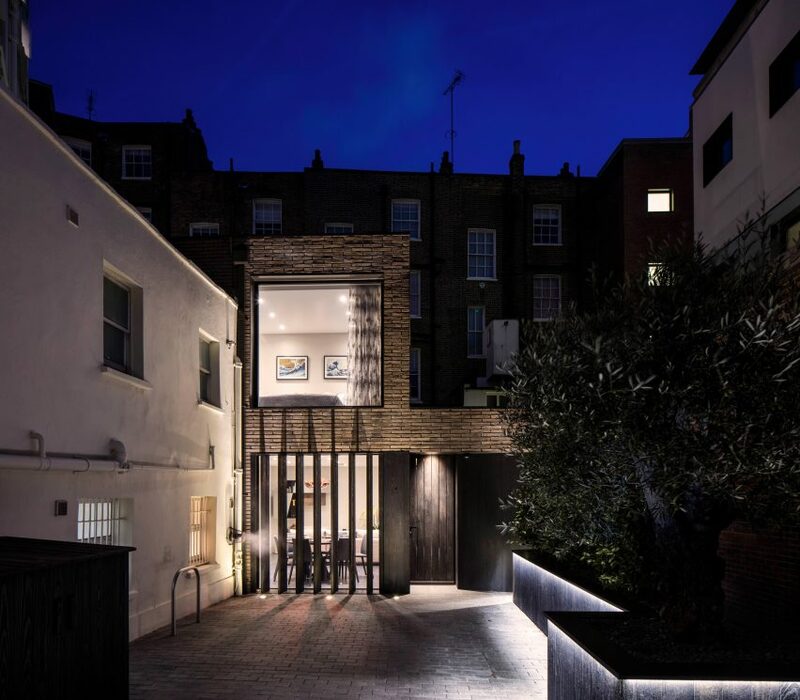 The building’s ground floor was extended into the courtyard to increase the floor area available for an open-plan living space containing a lounge, dining area and a kitchen with a breakfast bar. The main entrance leads straight into this reception area, which receives additional natural light from skylights set into the roof of a single-storey section containing the light well and a cloakroom. A toilet and the stairwell are located in a back corner of the building surrounded by party walls. A skylight allows daylight to reach the staircase, which has treads made from translucent glass to ensure the light filters down to the basement. The stairs ascend to a first floor containing two double bedrooms, one with en suite, and a family bathroom. The second bedroom is dual aspect and looks out onto the courtyard through its large picture window. Belsize Architects previously overhauled the locker room at the London School of Economics, painting its exposed steel frame bright-red and integrating the lockers into cabinets with house-shaped profiles. Photography is by Will Scott Photography.